Kids Sports & Self Worth, Monitoring the Self-Talk - "So, I've been thinking..."
Kids Sports & Self Worth, Monitoring the Self-Talk. So Iâ€™ve been thinking about a conversation I had with my oldest son, N, yesterday and it keeps interrupting my thoughts as Iâ€™m going through my day today. Itâ€™s a conversation that I thought wouldnâ€™t happen at his age, 11. Itâ€™s topic, while not tragic, made me sad. Iâ€™m sad to think that a child his age could already be filled with self-doubt and negative self-talk. I thought he was too young to experience it, but heâ€™s not. Heâ€™s watching a friend struggle publicly with feelings of not being good enough. His friend is openly criticizing himself, his abilities and is verbally beating himself up. 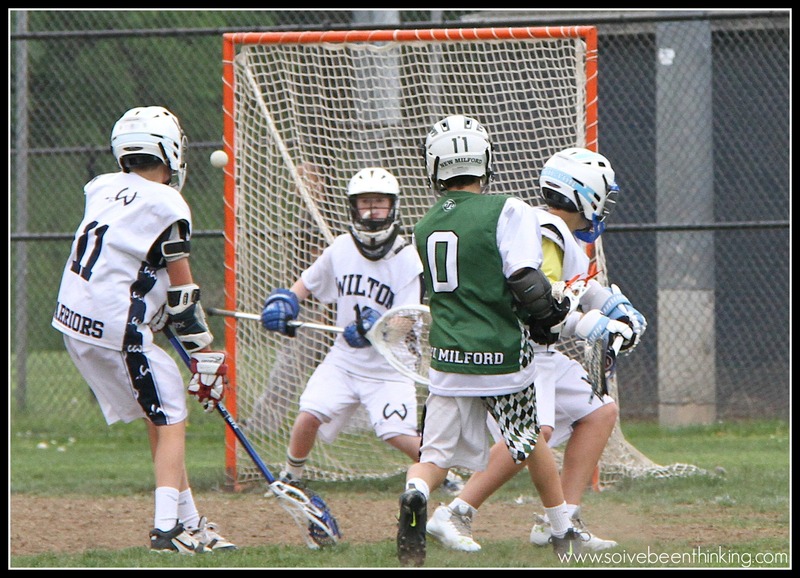 In this particular situation, a new lacrosse season is just beginning and there are a lot of kids playing at his age group, so the players have been split into three teams. Of course, despite telling the kids that one team is â€œAâ€ and the other two are â€œBâ€ some believe itâ€™s an â€œAâ€, â€œBâ€, and â€œCâ€ situation. And in all honesty, it probably is. There are a number of players on the â€œCâ€ team who are good players and could probably be on the â€œBâ€ team, but itâ€™s a numbers game, too many kids=not enough playing time, so the teams are split based on ability and experience and that leaves one team, the â€œCâ€ team, a mix of good players and the beginners (of the same age group.) It is important to note: at the time Iâ€™m writing this, there have only been two practices and one scrimmage. The season has barely begun so no team can officially be declared good or bad. Friend: My team is hopeless, weâ€™re the reject team. N: (after a discussion with me about how to respond) I donâ€™t like it when you say that. If I were on that team and you werenâ€™t you would never call it the reject team. You have good players on your team (and he names some). You shouldnâ€™t talk about your team that way. Friend: You would never be on this team. Itâ€™s a terrible team. Not knowing what else to say, and knowing he couldnâ€™t convince him otherwise, N didnâ€™t respond to his friend. In and of itself, this is not a horrible exchange, but this isnâ€™t the first conversation theyâ€™ve had about the teams, how they were determined and why his friend is on the â€œCâ€ team. Nor is it the first time Nâ€™s friend has criticized himself and his team, itâ€™s been going on for a couple of weeks now. What bothers N most is how down his friend is about his placement, how negatively he speaks about himself and his team. N is confused by it and sad about it. Having just come off a winless winter basketball season and an almost winless fall football season, N is no stranger to losing or being on a team that just canâ€™t get it together. Throughout football and basketball and as a result of this text exchange, he and I talked again about sports and friendship. After every basketball game Iâ€™d ask, â€œdid you have fun?â€ and we would discuss good plays and close shots. Of course thereâ€™s disappointment in not winning and even some embarrassment about being the only team in the basketball league to not win a single game. However, the message was always: try your best and have fun. There were no tears, no criticisms. I tried to help him keep the perspective of, â€œyou win graciously and you lose graciously, you play to have fun and build relationships with your teammates, there is so much more to sports than winning or losing.â€ N didnâ€™t play to win at all costs, he wanted to win but he played because he was having fun. He tried hard each game and still missed a lot of shots. He didnâ€™t come off the field or the court mad at himself, though, he ended each game, well, disappointed maybe, but feeling good about his effort and knowing he did all he could to help his teams. I know thatâ€™s not the reality. Kids want to win. A lot of value is placed on winning and being on a winning team and being the best player on the winning team. As adults, we do bear a certain responsibility to our kids to help them maintain perspective, though. A child should not be determining his self-worth based on a team placement (â€œAâ€, â€œBâ€, or â€œCâ€) or the win/loss record of their sports team. Itâ€™s just not that important. The euphoria of the win is fleeting, the feeling of disappointment after a loss should be just as fleeting. As parents, we tend to pay attention to what we say in front of and to our children. We monitor and hold back words and thoughts that might be hurtful or harm them. Most of us wouldnâ€™t criticize or demean our children intentionally. What we also need to start paying attention to is what they are saying to and about themselves right here, in front of us. The self-talk is there and they donâ€™t yet know enough to monitor it. By listening to what they are saying, we can help them navigate their experiences and maintain perspective so no child is determining their value and self-worth based on something as simple as a kids sports team. Loved reading this. I can totally relate. Our boys are at a difficult and confusing age in sports. Growing up they have been told to have fun and enjoy playing with their friends on sports teams. Then all of a sudden, at about this age, coaches expect better performance and want winning teams; and their friends are competing against each other for playing time and keeping their own stats. I think for us, it is hard to see this transformation happening to our “little boys”. I agree Thea, it’s tough to watch and not interfere or helicopter. This is just the beginning of situations they will have to manage using their character and self-esteem. I can only hope I’ve helped provide a strong enough of base for my children to draw from when they have to start digging into it. Congratulations!! So happy to be in on the ground floor of your blog launch! Every good writer should publish, and no doubt this is only the beginning of a fulfilling journey for you… and what a beginning it is! Great article!! Agreed there is so much pressure out there for our kids… some of it good, if it is harnessed in a way that pushes them to reach their full potential, whether it be sports, academics, art, etc, but when the pressure becomes too great or the perspective is lost, it can be damaging. Most often though, as you pointed out, it can be the way we view ourselves, if it is in an unloving way, that allows the pressure to succeed to become overwhelming. Loving ourselves can sound egotistical, but it’s essential if we are to be kind to ourselves and others. Thank you April. Wise words. Fortunately or unfortunately, this topic opens a lot of avenues to explore when it comes to self-worth, self-esteem, ego, and on, and on, and on. I hope this situation has resolved, because I know how detrimental a bad experience can affect a young boy.Â Found you on the May Blog Challenge! plaingracesÂ I’m finding as we get more involved parents and coaches really “run the gamut” you have some really great people and intentions and then you hear other stories. It’s never cut and dry and it’s never easy. It takes a lot to manage the situation and still keep it positive for our kids and hope they come away having had a fun and positive experience. I’m glad you’ve found a solution. N’s friend seems to be doing a little better and the season seems to be going well so hopefully this will end up being a learning situation that ends well for everyone! Pingback: Spring means Lacrosse - "So, I've been thinking..."